This might have been the most pivotal game of the entire 2012 postseason. I remember watching it with my mom. It was an afternoon game and the Giants had fled San Francisco after getting their proverbial baseball asses kicked by the Reds, losing both of the first two games at home. 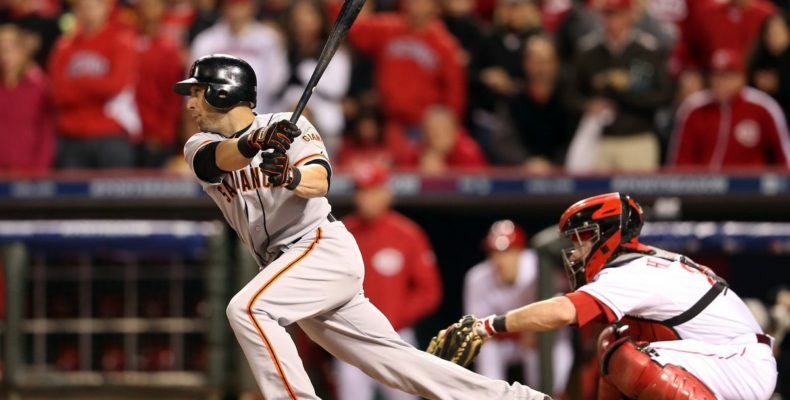 This was the do-or-die game that started the Giants record-breaking streak of nine consecutive elimination wins in a row, counting the 2012 and 2014 postseasons. Homer Bailey was absolutely dealing and limited the Giants to one hit through seven. Note the interesting dialogue by Ron Darling, Brian Anderson and Joe Simpson on Brandon Crawford: “The Giants are high on this kid. They say he has the makings of a gold-glover. I see a potential power-hitter too…”. Note the play on the winning run: Joaquin Arias hit a routine chopper to third baseman Scott Rolen who flubbed it but recovered very quickly and made a very strong throw to first that would have nabbed a baserunner who was not running hard or who assumed the play was going to be made. Arias, to his eternal credit, ran hard out of the box and just beat the throw! That’s why you run out every play! This was also the game that started the Reverend’s legend with an inspiring pre-game speech.